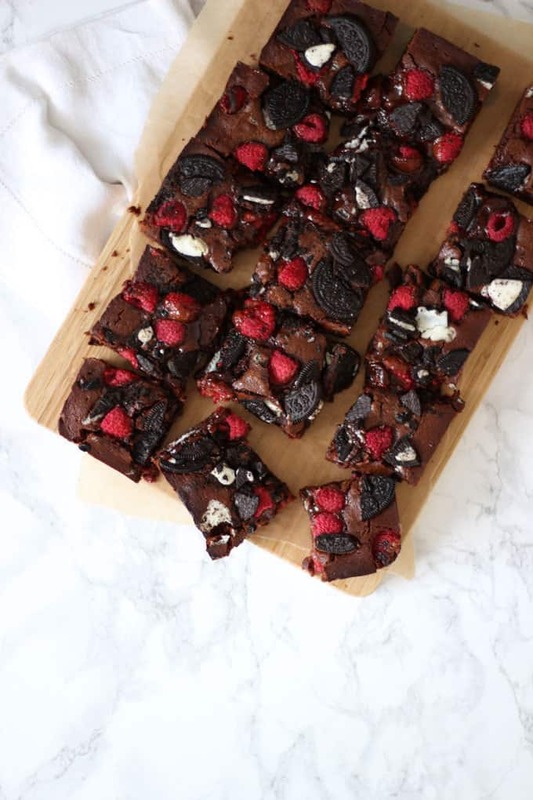 Fudgy Oreo Brownies with Raspberries – Gooey chocolate brownies with a double layer of Oreo cookies and raspberries. Because fresh fruit in brownies cancels out the chocolate, right? These easy chocolate brownies have freshness from the fruit and crunch from the biscuits. So, on a day when I was short of time and a last minute birthday bake was required, this idea popped into my head. Because, what’s better than a gooey chocolate brownie? 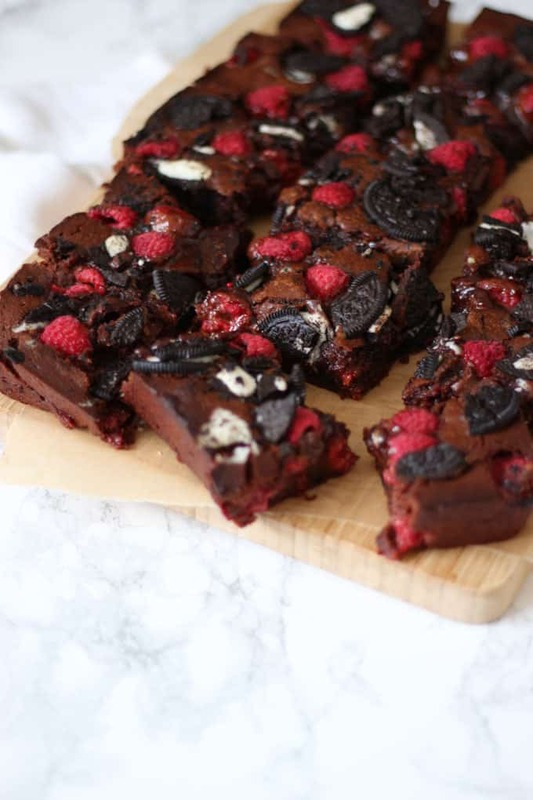 An Oreo Brownie with Raspberries! The Oreo cookies add crunch, the fruit adds freshness, all with a backdrop of deliciously dense and decadent chocolate. The birthday was Uncle Dave’s, my husband’s best pal. He’s not actually either of our brothers, but somehow he ended up as Uncle Dave and it’s stuck. These Oreo Brownies with Raspberries made such a fun birthday bake, piled high with a candle on top. Uncle Dave, we love you and I hope you enjoyed the brownies, happy birthday my friend! How do you make Chocolate Brownies? Start by melting your chocolate, butter and sugar together and mixing your flour and eggs, all in the same saucepan. This recipe is based on a much loved Nigella brownie recipe, with numerous tweaks. I love the Nigella brownie method as it’s such an easy way to make gooey chocolate brownies. This recipe adds in Oreos and Raspberries too, just simply layered into your baking tin with the brownie batter. I use disposable foil baking trays for this recipe as they are the perfect size, save on washing up and mean these are so easy to transport or give as gifts. I like these disposable foil trays from Amazon. These gooey chocolate brownies will be quite soft because of the fresh fruit. You can keep them in the fridge until serving to make them firmer. Don’t overbake them, cook until only just set. Be sure to resist and let them cool down fully before cutting. They will fall into a mess if you cut them before they are cold. Serve them for dessert with vanilla ice cream or, of course, piled high and topped with candles for a birthday. I used my favourite Callebaut chocolate for this recipe. This chocolate is just amazing, it melts so well and really makes a difference to any recipe. When you buy it in bulk (1kg bags at a time) from Amazon it works out about the same price as supermarket chocolate. A good investment I think as it really does make SUCH a different. Fancy some other easy brownie recipes? How about my Double Chocolate Microwave Brownies or my Chocolate Brownies with Celebrations Chocolates? Hope you enjoy this recipe as much as we do. 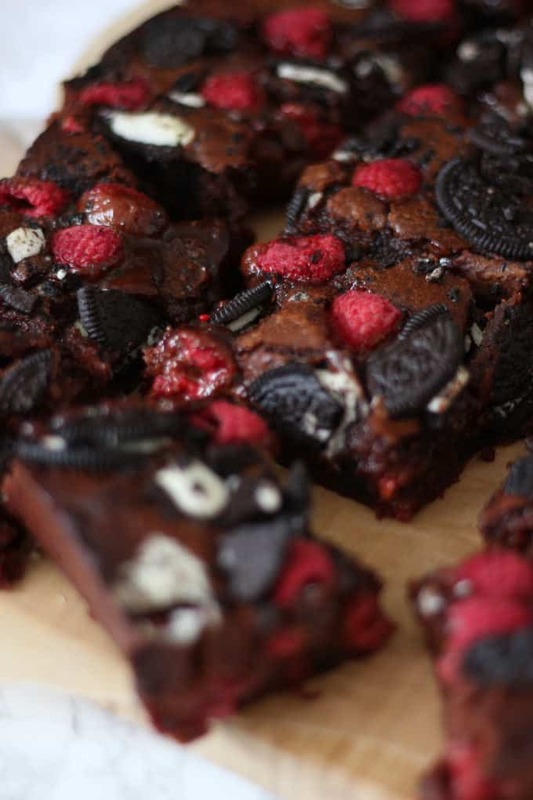 I’d love to know how you got on and what you thought of it if you make the Oreo Brownies with Raspberries recipe. Please rate the recipe and leave me a comment below if you do. 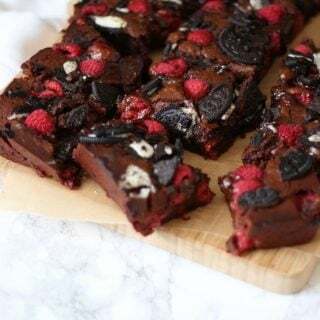 Fudgy, gooey, Oreo Brownies with Raspberries - Dense, fudge brownies with a double layer of Oreo cookies and raspberries. Because fresh fruit in brownies cancels out the chocolate, right? Heavy on the chocolate but with a touch of freshness from the fruit and crunch from the biscuits. Grease a 32cm x 20cm disposable foil baking tin. Put half of the batter in each of the tin to cover the base. Spread half of your raspberries and half or your chopped Oreos over this batter evenly, so you get some in each bite. Put the remaining raspberries and Oreos on top of this. Bake for about 25 minutes. A skewer should come out only just clean. You could test at 20 minutes and again at 23 minutes just in case. As always, remember that depending on your oven and the tin size you use it could take up to 10 minutes longer, but please please try not to overcook them. Brownies are always better under-done than over. Uh oh I totally should not have read this while hungry!! Looks divine! Uncle Dave sounds like a top dude – glad he got to enjoy this scrummyliciousness! I feel like the addition of raspberries basically makes this one of your five-a-day, right? Chocolate and raspberries are never a bad choice! Can I use gluten-free flour mix to replace plain flour?